➤The Anfan Olympic Weight Bench can handle up 660lbs of weight capacity. 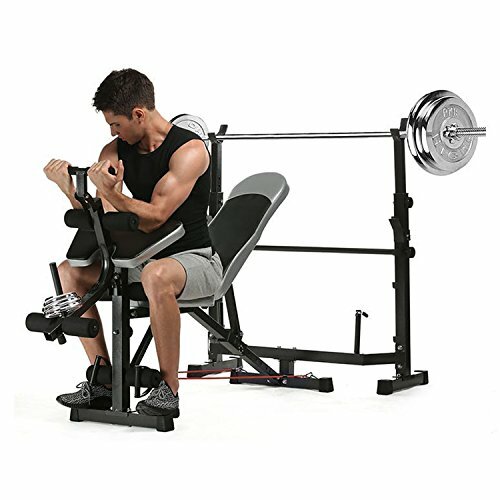 This is a Adjustable Foldable Multi-Functional Weight Bench with an Olympic Preacher Curl and Leg Developer Attachment, which gives you a great workout without needing a gym or fitness center. Vary and diversify your workout with the 6 level adjustable backrest to enhance agility, strength and endurance. Explode those muscle groups with a full range of dumbbell workouts at incline, flat, and decline positions. In addition, the Anfan Olympic Preacher Curl and Leg Developer Attachment can provide you with an extra boost of exercises for building your arm, thigh and leg muscles. ★【Multifunction】 This Gold's Gym bench comes built with a leg developer, weight lifting bench, squat station, Resistance band and preacher pad. 5-position back pad on steel weight set adjusts to chest press and incline press exercise positions. Solid barbell rack supports up to 660lb Olympic weight set. ★【Full Body Workout】 This training bench is great for a wide variety of full-body workouts. You can use it to develop both your upper and lower body, as the two-piece design allows for exercises that target both the arms and the legs. ★【Thoughtful Design】 This workout bench has the senior Imitation Leather seats and backrest pad for long-lasting comfort when lifting and sitting down. The rubber grips on the arm curl handle offer you added control, even when you sweat, "U"-shaped front leg stabilizer design to added safety and stability during workout. ★【Coming with Manual】 Help you install the bench and remove weight bench quickly( Barbell and weight plates are shown for demo purposes only, not included.) Enjoy your personal power training and build your body at home with your families.